AFL FUSE-LC-2M-MM50-6 LC type connector, Boot type 2mm. 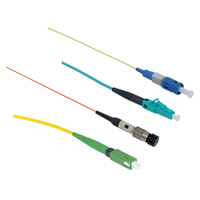 AFL’s FuseConnect fusion-spliced, field-terminated connectors are uniquely designed and feature just four components. With a factory pre-polished ferrule, its innovative field-termination process eliminates polishing, adhesives, and crimping in the field minimizing the potential for operator error and expensive connector scrap. FuseConnect utilizes a fusion splicer to terminate the connector in the field, addressing return loss concerns present in analog optical networks. This advanced process yields true APC performance of >65 dB return loss in an SC/APC configuration and SC single-mode is compliant to GR-326-CORE. Designed to work with an industry standard 10 mm cleave length and splicers utilizing a fiber holder system, FuseConnect is compatible with Fujikura fusion splicers and most other fiber holder-based fusion splicing platforms.